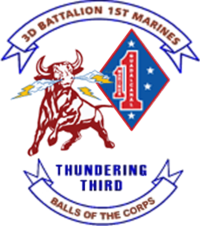 Unit: 3rd Battalion, 1st Marine Regiment, 1st Marine Division, I Marine Expeditionary Force, Camp Pendleton, Calif. The Department of Defense announced on July 13 the death of a Marine who was supporting Operation Iraqi Freedom. Cpl. 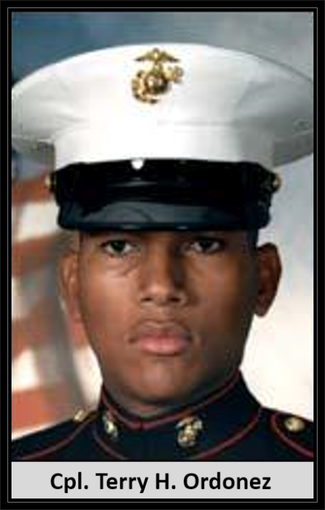 Terry Holmes Ordóñez, 22, of Hollywood, Fla. died July 10 due a non-combat related vehicle accident in Al Anbar Province, Iraq. He was assigned to 3rd Battalion, 1st Marine Regiment, 1st Marine Division, I Marine Expeditionary Force, Camp Pendleton, Calif. The incident is under investigation. Miami Herald -- A funeral service for Marine Terry Holmes Ordóñez, the Miramar High graduate killed in a vehicle collision in Al Anbar Province, Iraq, on July 10, is set for today. Visitation will be from 5 p.m., with a 7 p.m. prayer service at Fred Hunter's Hollywood Memorial Gardens Home. A funeral Mass will be said at 3 p.m. Sunday at Holy Sacrament Episcopal Church in Pembroke Pines. Ordóñez, 22, a transportation specialist, was the third of four children, and the youngest son. He was born in Puerto Cabeza, Nicaragua, and immigrated with his family to the United States in 1995, first to Paterson, N.J., and later to Hollywood, said his aunt, Lilliam Ordóñez of Brooklyn, N.Y. Ordóñez's family had been celebrating the 53rd birthday of his mother, Guadalupe, on the night of July 10, only to have the festivities turn to mourning three hours later when two Marine officers came to her front door in Hollywood to report her son's death. Ordóñez had been working at Renaissance cruise lines in Fort Lauderdale when he was laid off after the 9/11 attacks, and then became a student at Broward Community College, his aunt said. ''He joined the Marines to continue his education,'' she said. ``He didn't want to be a burden to his mother.'' Ordóñez had ambitions of becoming an electrical engineer and would regularly give his mother money to help pay bills, she said. She added: ``Terry is the son that any woman would want to have.'' Ordóñez ''didn't tell his mother what he was doing until he joined up,'' Lilliam Ordóñez said of his decision to enlist in the Marines. The other Marines who were killed with Ordóñez in the collision of two Humvees have been identified as Sgt. Krisna Nachampassak, 27, of Burke, Va.; Pfc. Christopher J. Reed, 20, of Craigmont, Idaho, and Staff Sgt. Trevor Spink, 36, of Farmington, Mo. The men were all assigned to the 3rd Battalion, 1st Marine Regiment, 1st Marine Division, 1st Marine Expeditionary Force, Camp Pendleton, Calif. Anbar, a Sunni-dominated area west of Baghdad has been a hotbed of anti-American resistance, the Associated Press reported. In addition to his mother, Ordóñez is survived by his father, Elacio Holmes of Homestead; brother Edgar Ordóñez of Miami; sisters Eveling Holmes and Maura Wilson, both of Hollywood; and grandmother Maura Ordóñez of Miramar. Arrangements are being handled by Fred Hunter's Hollywood Memorial Gardens Home.